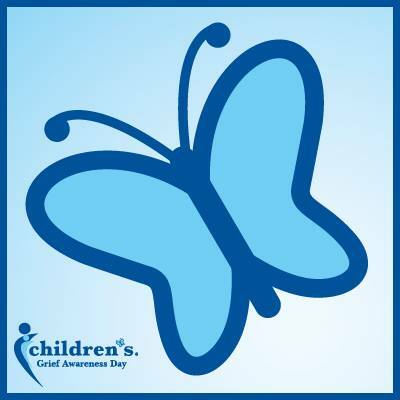 Thursday, November 20, 2014 is Children’s Grief Awareness Day. (It’s held every 3rd Thursday of November, the week before Thanksgiving’s 4th Thursday.) To learn more about the event, check out http://www.childrensgriefawarenessday.org/. I wear teal 364 days a year, but on Children’s Grief Awareness Day you’ll find me in blue, and I hope you’ll join me. Even professionals who work with children daily need to better understand and be aware of the unique needs of grieving children. Mrs. Blue’s husband died early one school year. Understandably, Child Blue’s academic year held many challenges and adjustments. As the first anniversary of Daddy Blue’s death approached, Child Blue faced greater academic and emotional struggles. The fog of new grief was gone, and the real work of grieving was in full swing. Before school began, Mrs. Blue contacted school officials, attempting to put into place strategies and awareness to help Child Blue weather that grief-strewn time of year. Sadly, the school wouldn’t allow a meeting with all necessary parties until November (ironically, near Children’s Grief Awareness Day), months after the start of the academic year and the first anniversary of Child Blue’s father’s death. At a follow-up meeting, Mrs. Blue and Dr. Clueless were the only ones in the room before the others arrived. Because of Dr. Clueless’s comments at their prior encounter, Mrs. Blue asked, “Dr. Clueless, have you ever worked with any other children who’ve lost a parent?” She was stunned to learn that Dr. Clueless had, in fact, worked with many, many grieving students over a 20-year period. How sad that in all those years, Dr. Clueless had not developed an awareness of children’s grief and grieving. How fortunate that Ms. Aware, in far less than half that time, had developed such an awareness. I’ve created a page of “Helpful Grief Resources” with examples of what to say when someone dies (and what not to say). I’ll add new sources as I encounter them, so check back from time to time. Have you found useful sites, books, articles–even songs–that helped you interact with the bereaved? If you’ve suffered a significant loss in your life, what comments or gestures from friends were most (or least) helpful to you? Together we can ease the anxieties of those who wish to help their grieving friends — and thereby help the mourners, too.